An excerpt from the second volume of Greg Parker's study of the historical context for Lee Harvey Oswald's intelligence-related activities. The final installment of Jeff Carter's essay which takes an unconventional approach to the famous "backyard" photos of Lee Harvey Oswald: assuming they are indeed authentic, can one find a plausible alternative scenario which explains their origin and purpose? Part four of Jeff Carter's essay which takes an unconventional approach to the famous "backyard" photos of Lee Harvey Oswald: assuming they are indeed authentic, can one find a plausible alternative scenario which explains their origin and purpose? In this provocative five-part series, Jeff Carter takes an unconventional approach to the famous "backyard" photos of Lee Harvey Oswald: assuming they are indeed authentic, can one find a plausible alternative scenario which explains their origin and purpose? David Josephs reveals various issues with the Judyth Baker story which undermine its credibility. 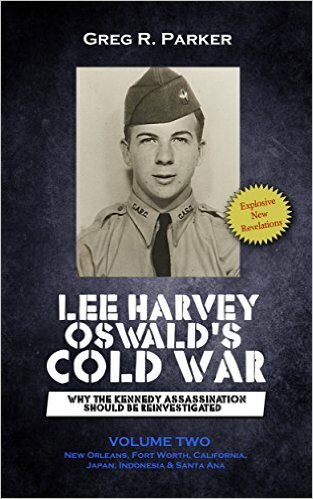 David Joseph reviews in detail the evidence for Oswald's alleged trip to Mexico City – Part 6. None of the Shenon's sources brought a single quantum of proof for turning plausible his Castro hypothesis. Their suspicions, impressions, beliefs, admissions, second-hand tales, and suggestions are linked to long-ago debunked stories. For sticking with them along the substantiation of his hypothesis, Shenon must concoct [various] 'facts', writes Arnaldo Fernandez.